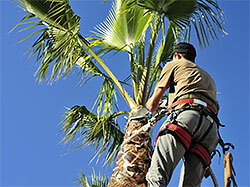 California Creations provides complete Tree Trimming and Removal services throughout Southern California. We service residential, commercial and government properties. 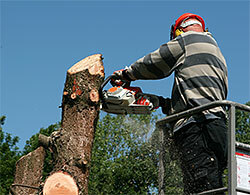 Tree trimming improves the trees’ health and enhances appearance. It also increases safety as it reduces the risk of falling trees and branches and eliminates obstructions of walkways, roadways, security lights, etc. Tree trimming also increases the property value. It would be a shame to invest time and money in landscape design and installation then fail to maintain it. The Tree Trimming and Removal services that California Creations provides can be included as part of our standard maintenance services or performed independently. Improve Tree Health: Tree limbs that have been affected by pests, diseases and/or fungal infestations along with weak/broken branches should be removed without delay. This prevents problems from getting worse and enables nutrients to be allocated to healthy portions of the tree. Tree trimming also prevents various problems such as insufficient sunlight reaching the plants that grow below the trees. It ensures that the proper distance is maintained between the trees and other plants. 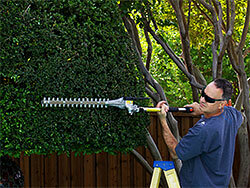 Increase Growth Rate: Regular pruning of plants and trees is a very effective means of promoting new growth. It also helps control the size, shape and density. Extend Longevity: Trees that are periodically trimmed have longer life spans than trees that are not trimmed. Aesthetics: Well-maintained trees improve the appearance of your property and inspire you to spend more time outdoors. It is not uncommon for trees to become uprooted from the ground or trunks and/or branches to break due to wind, rain, overgrowth, asymmetric growth, diseases, etc. Not only does California Creations trim trees to reduce these risks, we also remove fallen trees and stumps. We trim and remove fallen trees and stumps in a safe, professional and thorough manner leaving you with a safe and beautiful outdoor environment. If tree roots are damaging your drainage, irrigation, foundation or structure, we would be happy to give you a free estimate for removing them. Our services will increase the value of your property and make outdoor living a pleasure. If you are looking for expert Tree Trimming & Removal services, contact California Creations at (818) 833-1231 or send your request via this online form. We have the knowledge, experience, trucks and equipment to handle all your requests with the highest level of professionalism. We will inspect your site, gain an understanding of your requirements, submit a highly competitive bid (at no charge) and provide you with the best quality service in the Southern California.